Above you’ll find another update on the oil production in the 4 major US shale oil basins. You can see the total oil production from 47602 selected horizontal wells, in the 4 most prolific US shale oil basins, that started flowing since 2003, up until March 2016. Total oil production from these wells reached 5.0 Gbo (with an average gas-to-oil ratio of 3.4). As I include now all horizontal shale (or better said, “LTO” (Liquid Tight Oil)) wells in Texas, also the ones in gas leases, the total oil (incl. condensate) production shown in this update is much larger than in my previous US post. Because of the recent additions to my database in the past few months, I belief the presentation contains now the individual production profiles of horizontal LTO wells that together produced almost 90% of total LTO production in the US, and more than 50% of onshore oil production in the lower 48 states. In the Well Quality tab, you will find a few more formations being present now, such as Granite Wash, and Austin Chalk, both in Texas. The first tab (“Location of the shale oil basins”) will show you where all these wells are located. I normally show the total oil production graph with production grouped by the year in which the wells started production. However, just this once, the default is set such that all production is shown by the quarter in which the wells started flowing. This causes the chart to be a little more overwhelming, but because of the finer granularity, the underlying decline of the wells is better visible now. You can change the setting with the “Group production by” selection. The “well quality” tab shows that recent wells produce a little more early one, but that after 1-2 years on production, the average recent well performs very similar as earlier wells. Of course, there are major differences per basin/operator etc., and this can be explored with the filters and selections. On the “well status” tab you can find the status, and production levels, of all wells, over time. Note that I don’t have “spud” and “plugged” info for wells in Texas. If you set the filter to show only “spud” wells, you can see that at the end of March, outside Texas, a total of 1859 wells were spudded (but not yet producing). If you want to see the number of wells brought online, you can set the selection to “first flow”; you will then see how the monthly number of newly producing horizontal wells dropped from over over 1100 by the end of 2014, to just over 300 in the last few months. This was a major drop, but less than the drop in rig count. Coming Thursday I plan a post on gas production in the Marcellus basin, in Pennsylvania. After that I aim to make a post on how I expect the production from legacy LTO wells to unfold over the coming 2 decades. Amazing and very helpful. I will spend some time here visualizing the different plays. Your comment that average gas-to-oil ratio is 3.4 matches what I have, assuming it’s 1000CF per barrel. 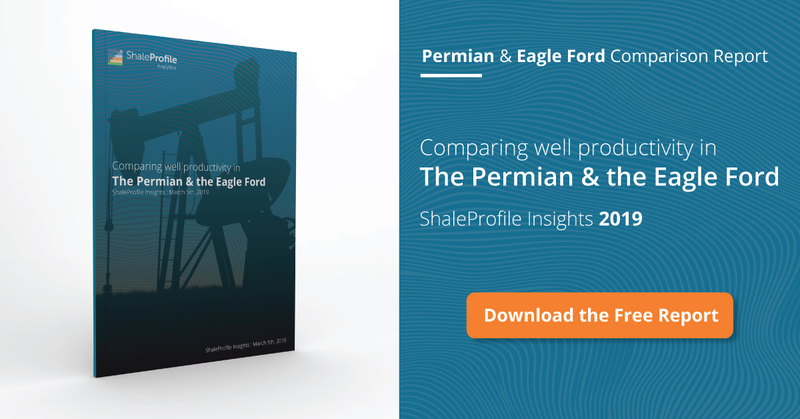 Eagle Ford and Permian appear to have the highest average gas-to-oil ratios, about 5. 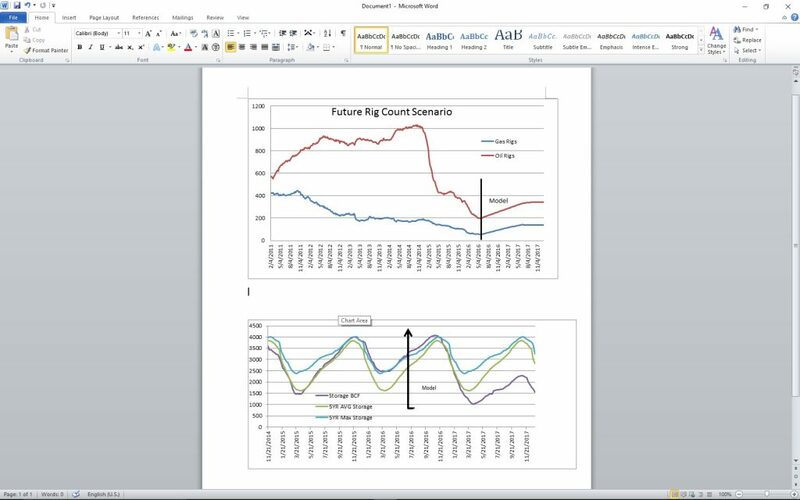 Attached is a recent model scenario result for 7-Basin gas production and Total U.S. storage. Do you know where I could find average well production decline curves for each basin? Found your well production decline curves, awesome, and thanks! Great to hear that Joseph. There is a lot of information here, I recommend going over the different tabs, and try the selections and tool tips. Correct. This may go up a bit, as I may include a few more gassy wells in the near future.